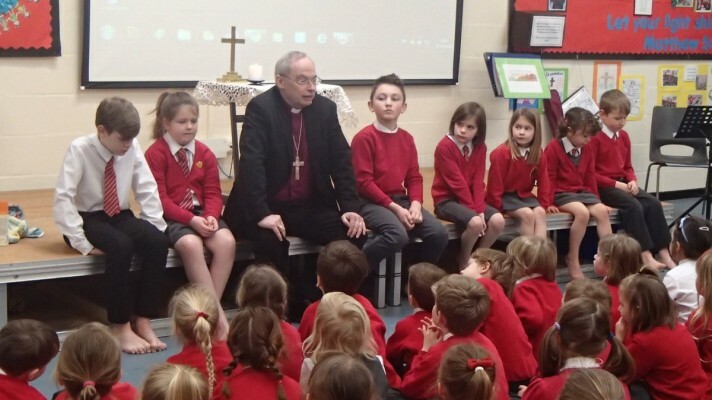 Bishop Richard and Dr Annette Daly, the Diocesan Director of Education, were delighted to join Ponthir Church in Wales Primary School for collective worship in the approach to Holy Week. Mrs Ceris Spooner, the head teacher, explained about how we can show love by serving others. As an illustration of this, she told about how Jesus washed the feet of his disciples and, in so doing, modelled this “serving of others” to his friends. 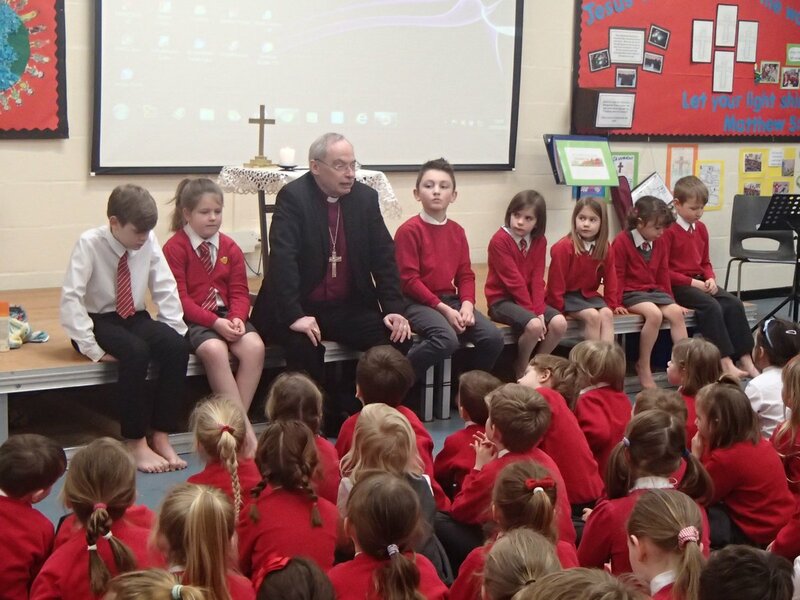 One child from each class was selected to have their feet washed… and Bishop Richard was also invited to join them! There was warm soapy water available in a bowl and great humour as the task was carried out! It was an entirely appropriate context for putting one’s foot in it! 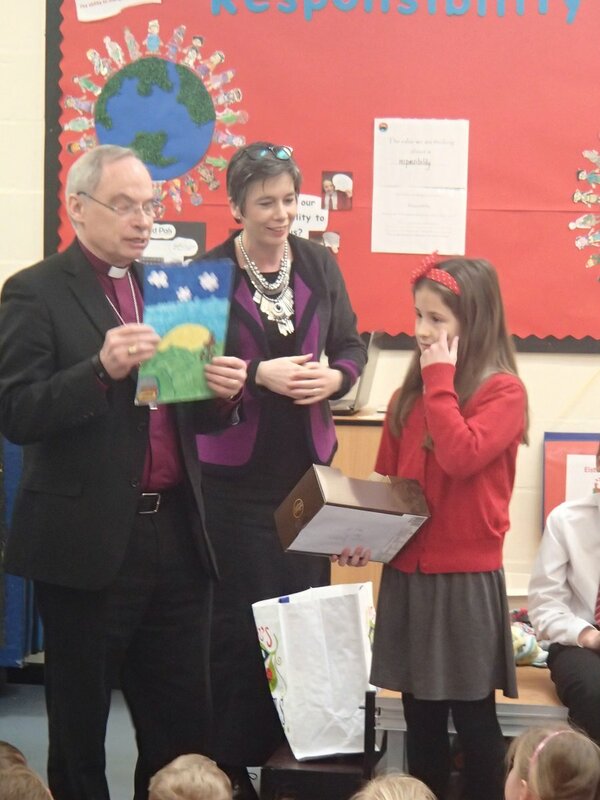 The visit was also an opportunity to thank all the children, as the selected school on this occasion, for designing Easter cards for the Bishop’s Easter Card Competition. They were all commissioned to provide illustrations of the resurrection and hope of Easter and Bishop Richard was very impressed with the sense of spiritual understanding conveyed in the children’s illustrations. Second and third prizes were also awarded. The winners were all presented with their prizes, chocolate Easter Eggs, kindly provided by The Meaningful Chocolate Company who sponsor these competitions in our diocese and who share our vision in keeping alive the true meaning of Easter and Christmas. Bishop Richard also used the opportunity to say a few words of thanks and appreciation to Mrs Spooner who is taking early retirement after having worked in the school for ten years. She will be very much missed by the staff, governors and pupils of the school and the Diocese wishes her every blessing and good wish for the future. This was posted on 10 April 2017 and updated on 20 June 2017.